Choosing an adult dog food that will help keep your dog healthy and active begins with identifying your dog’s lifestyle and eating habits. For instance, does your dog go on long walks each day? Is he the ideal weight? Is he a lap dog that loves to sleep all day long? Answering questions such as these will help you select the best dog food. However, there are additional factors to keep in mind. It isn't just the diet or brand of food to focus on; you also need to help your adult dog maintain a healthy lifestyle. The most important thing to do when feeding adult dogs is to ensure they are fed a healthy, balanced diet. Check ingredient lists for a statement of nutritional adequacy. It should meet the nutrient profiles established by the Association of American Feed Control Officials (AAFCO) and be appropriate for all life stages. It is important to make sure your dog's diet is top notch. If you can build up their immune systems and strengthen their primary organs while they are adults, they have a much greater chance of entering their senior years healthier, stronger, and happier. This is something that can ultimately affect their lifespan. Observe changes in the condition of your dog’s coat, hair, and body. If your dog seems to be thriving on the diet and has lots of energy, a shiny coat, and appears fit, the food agrees with him. An adult dog needs at least 10 percent of his daily calories from protein and at least of five and a half percent from fats. Your adult dog’s food can contain up to 50 percent carbohydrates, including between two and a half and four and a half percent fiber. Choosing a diet plan that is ideal for your dog depends on your preferences and dog. 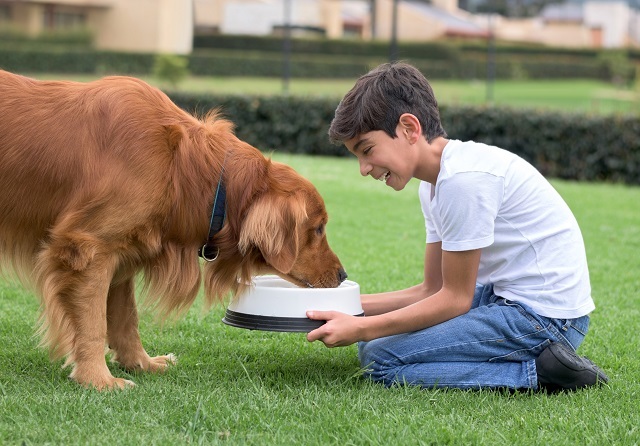 Dry dog food provides more nutrients than wet food because it contains less moisture. You also won’t need to feed as much to satisfy your dog’s nutritional requirements, making it a practical choice for large dogs owners.